Hindi 41%, Bengali 8.1%, Telugu 7.2%, Marathi 7%, Tamil 5.9%, Urdu 5%, Gujarati 4.5%, Kannada 3.7%, Malayalam 3.2%, Oriya 3.2%, Punjabi 2.8%, Assamese 1.3%, Maithili 1.2%, other 5.9% English enjoys the status of subsidiary official language but is the most important language for national, political, and commercial communication. 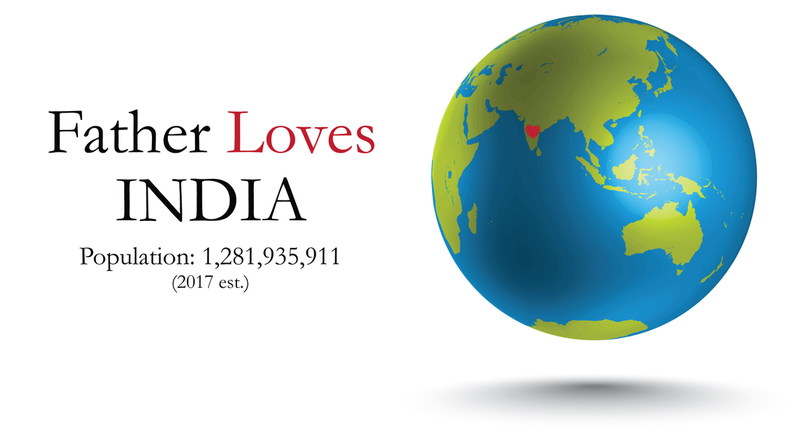 Father, I declare your love over India and for everyone who lives there. I pray the good news of your beloved Son would reach every person in this nation. I thank you Father that you have already poured out your Holy Spirit on all flesh so I am asking for the seeds of your love to bear much fruit in India today. Father, I also ask that you would strengthen every believer in India and impart to them a greater revelation of your love so they would truly know they are your sons and daughters. In agreement with your children who are praying this same prayer today, I declare the life changing truth that my Father loves India!